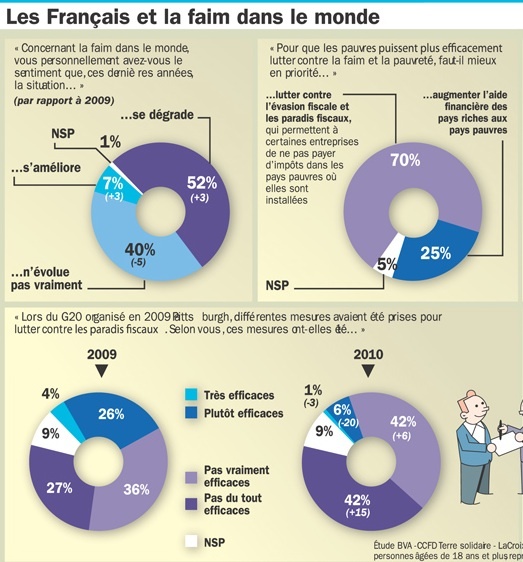 The French Catholic newspaper La Croix has published a remarkable graph showing how far sentiments have changed recently, as to the causes of hunger and poverty in developing countries. In September 2010 the CCFD (comité catholique contre la faim et pour le développement) asked 985 people aged 18 and over to ask for their opinions about various issues with respect to poverty. Click the graph to enlarge it (and click on the article to see more results). For those who don't read French, two things here stand out. First is the chart in the top right, reporting the answers when people were asked what the most effective measures for fighting poverty in the world. A quarter of them (in blue) said that increasing foreign aid should be the highest priority. But here is the stunner: a full 70 percent said that fighting against tax evasion and tax havens was the answer. The second surprise was the pair of pie charts at the bottom, representing shifting attitudes towards the effectiveness of measures taken by the G20 and OECD against tax havens, amid claims by the likes of President Sarkozy that "tax havens, bank secrecy, are finished." In 2009, 30 percent thought the measures had been very effective of mostly effective, while 62 percent thought they had been rather or very ineffective. A year later, and only seven percent think they have been very or mostly effective, and 84 percent think they have been very or rather ineffective. Which puts the majority of the French population in line with TJN. Remember, this is not a survey of people who are already committed to the fight against tax havens. This was a survey represenative of the French population at large. With extreme congratulations due to our French colleagues in the non-governmental organisations who have worked tirelessly to raise awareness of this issue. Who controls the French media? Is it diverse or narrow? Just wondering how easy it is to get the point across in the UK and if there is a problem, what can be done to improve the situation. The French printed media is fairly diverse. For example, the extract here is from a Catholic daily newspaper (titled, literally, 'The Cross')! - like you'd ever get that in Britain. However, is this supposed to be a real survey? but maybe when the work experience go back to school someone can write a questionnaire with more than 3 options?